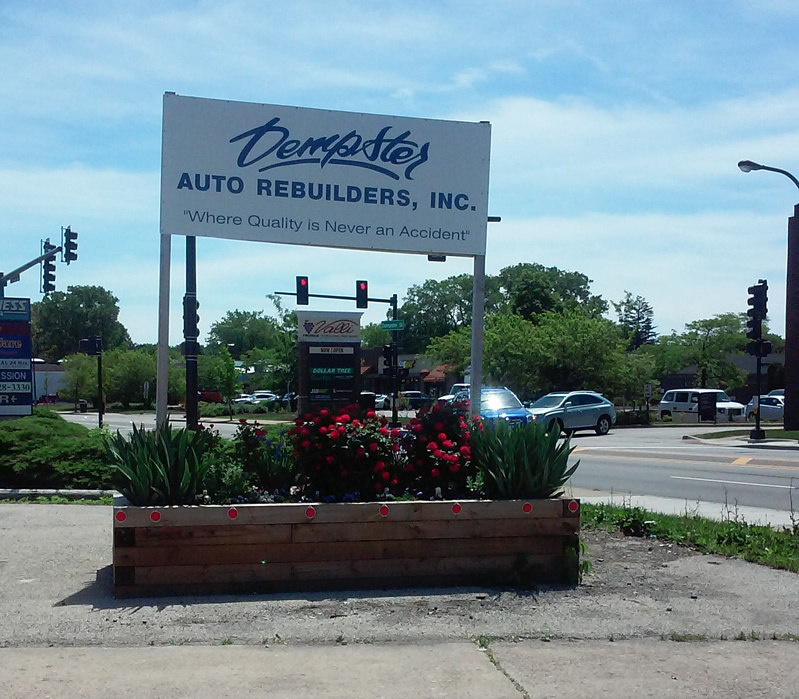 Services – Dempster Auto Rebuilders, Inc.
Repair to/or replacement of sheet metal, plastic, sheet molded compounds, steering and suspension components, exhaust systems, and other related components damaged by collision. We prefer the use of new original factory parts in the repair process and will not use other parts without customer approval. Restoring corrosion protection and color/clear coat finishes to the automobile to match original factory finish. We use a computerized paint mixing system to ensure correct color matching to OEM formulas. We are using the latest waterborne paint system to duplicate the same process the manufacturer uses, and reduce our carbon footprint by over 80%, our yearly reduction will be the equivalent of removing 1200 cars from the highways. Today’s vehicles no longer have frames, the unibody has replaced the frame on most vehicles. We utilize two unibody straightening units which allow us to perform the multiple pulls necessary to bring vehicles back to factory specifications. Our specialists have more than 40 years experience in performing these highly skilled operations, and are certified by ASE and I-CAR. All vehicles that have had an impact at the suspension or wheel area are given a suspension alignment. We utilize a laser alignment system to ensure the most accurate alignment possible for our customers. Because of today’s clear coat finishes we felt it was necessary to offer to our customers a service which would allow them to keep their cars looking brand new for years to come. Detailing includes shampooing the entire interior of the vehicle (carpets, seats, floor mats and door panels), and applying a protective coating to dash and door panels. The exterior is hand-washed, machine buffed with special formula cleaners for clear coat finishes, then hand waxed. We dress all the exterior rubber so the finished vehicle looks new again. Due to the unpredictable nature of accidents and their extreme variety, it is impossible to provide a satisfactory quote without viewing the damage to your automobile. To receive a free estimate just stop by our facility during regular business hours. To schedule an appointment, call us at (847) 864-1101 or fill out an appointment form. We accept insurance work from most insurance companies. Our warranty is quite simple: we will guarantee all work that we perform on a customer’s vehicle for as long as they own that vehicle. This lifetime warranty includes any defects in our workmanship or materials on all metalwork such as, cracking, flaking, pitting or deterioration. Our refinishing is warranted against solvent blistering, peeling, hazing, or excessive loss of pigmentation. Exclusions to this warranty are negligence, accidents, abuse, misuse, or extreme environmental conditions which the vehicle may be exposed. The leading industry groups have certified all members of our staff in their individual specialty, they include the National Institute for Automotive Service Excellence (ASE), The Inter-Industry Conference on Auto Collision Repair (I-CAR), Society of Collision Repair Specialists (SCRS), as well as General Motors, Toyota Motors and PPG Paint.